Friedensau is home to a university run by the Seventh-day Adventist Evangelical Church. It was founded and built in 1899 by the Church specifically for theological education and charitable purposes. In 1990, this educational establishment was recognised by the State as the Friedensau Adventist University. 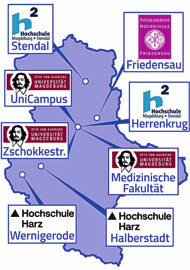 The place is characterized by the Friedensau Adventist University and its institutions. The sprawling campus permeates large parts of the area, about two-thirds of the buildings belong to the university. Cultural and intellectual life is largely determined by the university.